Wow, wow. I loved this book and I need the second book IMMEDIATELY. I’m always on the lookout for great indie reads, and I just can’t believe I haven’t found this book before now! How have I not heard of Gwenn Wright before I stumbled across Filtera few days ago? She is an incredibly gifted storyteller. Filter follows two storylines, that of Rocky Evans, a 17 yr. old girl from present day, and Katherine, a 16 yr. old girl from 1877. Rocky is an orphan from Nashville who lives under the guardianship of a friend of her mother. She’s from the “wrong side of the tracks” and grew up trying to make ends meet, dodging rent collectors, and avoiding her alcoholic guardian’s increasing and disturbing interest in her. When a young lawyer shows up saying that his firm’s been looking for her, Rocky is presented with an opportunity to escape her less than ideal situation and discover the family she’s never known. Katherine Demure, lives with her wealthy family in 1877 St. Louis, MO. Although plagued by weakness and illness she is a strong, opinionated girl who longs for exciting, novel-like adventures. One evening at a dinner party that her parents’ host, she accidentally meets the equally infuriating and captivating Viktor von Strassenberg and begins a journey that will rival even the darkest of gothic romances. Wright’s formatting of this book is part of what makes this book so “un-put-downable.” (Yes, you can quote me….lol.) She switches the story’s POV chapter to chapter (first person for Rocky and third person for Katherine) and masterfully keeps the mystery moving through both storylines, revealing just enough to make sense of both stories, and often leaving you with mini cliffhangers until that heroine’s next chapter. I’ve read some books recently where the shift between narrators is just a confusing mess; however, this is never a problem in Filter and the shift between narrators/timelines is one of this story’s greatest strengths. Another aspect of the shifting POVs that I absolutely LOVED was that each POV was written to the period of the narrator. I absolutely hate when period pieces sound too modern day, but Wright has expertly tailored each girl’s POV to their respective times. 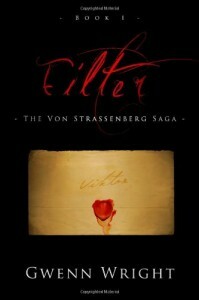 I don’t want to give anything away in this story, but Filter is a dark gothic romance and to me evokes a little Bronte, and some other authors that I won’t mention for fear of revealing too much….<wink wink>. Most paranormal-esque YA books are pretty predictable; it can be pretty easy to guess what the schtick is….but I have to say that up until 2/3 of the novel I was kept guessing, wondering what in the world was going on. And I love that! I love being given the opportunity to not know…to develop a couple wild theories on my own. Wright really has created something original and lovely with Filter that will stay with you long after the story is over. I would recommend this for older teens due to some heavy thematic elements.